This is the video recording of the second Laibach concert appearance in Zagreb, which happened at the YURM (YU Rock Moment) Festival in the Moša Pijade Workers’ University, on December 11, 1982.At this appearance an incident occurred that resulted in the group’s hardly being able to finish the concert. Dressed in the uniforms of the Yugoslav Army, Laibach, to make its programme more lifelike, made use of smoke grenades, which the members had smuggled out of the army, as they had the uniforms. One of the grenades went off too soon, injuring one of the girl assistants of Laibach and necessitating the calling of an ambulance. But military personnel also arrived with the ambulance to investigate the incident. 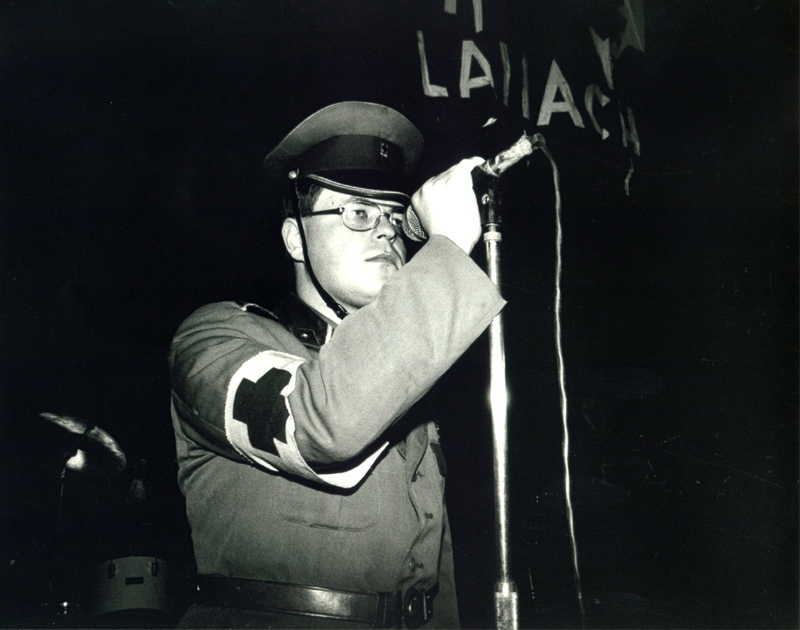 While Laibach was on the stage, one of the group members kept the group of officers busy outside the hall. Officers were investigating the accident and to their question why the group was dressed in YU army uniforms, and why musicians were using military materiel, a Laibach member replied it was “because of the military theme group was dealing with”. The officers finally left, and meanwhile Laibach managed to complete the concert, in a fair amount of chaos. Many things went wrong around this show. Firstly drummer did not show up, so the rest of the group decided to do the show without the drums, which resulted in a very unusual minimal, almost ambiental industrial fell of the concert. Unfortunately this was also the last appearance of Tomaž Hostnik, who a mere ten days afterwards committed suicide. His powerful but strange shout at the end of the show is unforgettable. For all these reasons the concert later acquired the name Touch of Evil.